Every year, fall’s crisp, cool air signals the imminent arrival of winter. Thoughts of snow, friends and family, the holidays, and — Jubelale. Brewed with dark crystal malt creating a luscious holiday note with bountiful hops to excite your taste buds— it’s easy to see why Jubelale is the perfect complement to the season. Jubelale pours a dark ruby, almost brown color. When held to the light this beer looks a delicious glass of cranberry juice. Interesting. The head pours huge and cascades from a dark tan where the liquid meets the foam, to a beige at the top of the glass. It soon settles into a one finger head of beige-colored foam. Light to medium lacing is present. This is a complex smelling brew. Hops, toffee, licorice, chocolate, lemon zest and Pinesol scents are all present somewhere in this enticing elixir. I couldn’t wait to dive in. WOW. Jubelale is an amazing complex beer! The initial taste that arrives is licorice, but not it’s not overpowering (don’t think Jägermeister or Good N Plenty). This soon settles into a mild hop presence, before finishing off with a delectable sensation of a mouth full of chocolate. As it mellows out/warms up, slight citrus notes appear in the backend. Which makes the final step kinda taste like a chocolate-covered orange. Mouthfeel is light and airy, even though this looks like a thick beer. You can actually hear the carbonation fizzing in your mouth! A slight alcohol burn is present, but it’s no where near distracting. 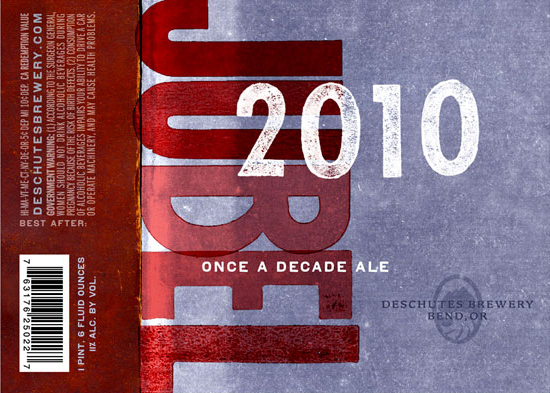 Jubelale 2010 is fantastic. Plain and simple. I now know why this limited release beer is so revered and why it’s so hard to fine (everyone is snatching it up!). The bottle says it’s best after 1/29/11, so I can’t wait to buy another bottle and allow it to mature in the “beer cellar”. You should probably seek out this beer. You’ve gotten me hooked on this stuff damn you! At first I thought it was okay… But as time went by, and I had more beer, different beer, I remembered how good this was. And now I crave it!